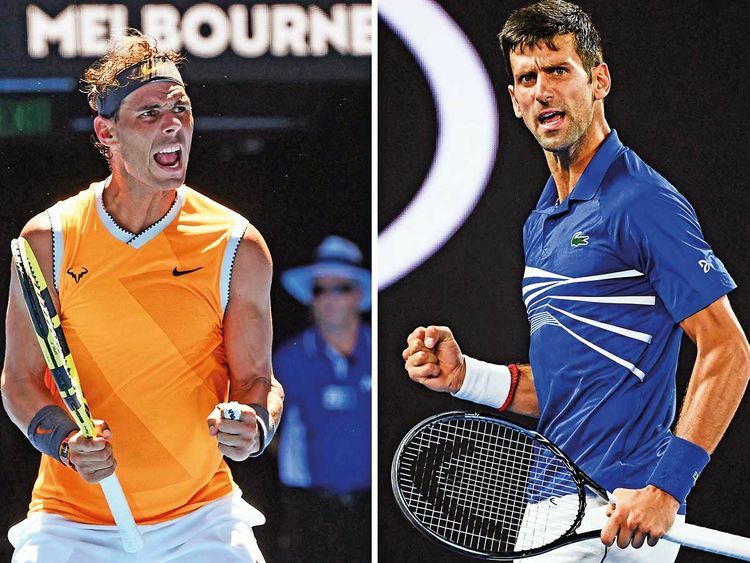 Melbourne: Novak Djokovic and Rafael Nadal will renew the “greatest rivalry” in modern tennis when they collide in a mouth-watering 107th Australian Open final on Sunday. The top two players in the world have 31 Grand Slam titles between them and each can claim another slice of history with victory. Djokovic, 31, will lift a record seventh Norman Brookes Trophy with a win while Nadal, 32, will become the first man in the Open Era to win all four Grand Slams twice if he adds to his 2009 Melbourne Park crown. Nadal’s 18th Grand Slam title would see him close the gap on Federer’s 20 at the top of the all-time list and Djokovic’s 15th would give him sole ownership of third place ahead of Pete Sampras. “These are the kind of matches that you live for: finals of Slams, playing the greatest rivals at their best,” said Djokovic after dismantling Lucas Pouille 6-0, 6-2, 6-2 in a lopsided 83 minutes in Friday’s semi-final. It will be the 53rd meeting two giants of the games and their eighth in the final of a Grand Slam. Djokovic is a whisker ahead with 27 victories to Nadal’s 25. But the Spaniard has the edge in Grand Slam finals 4-3 and has won the last three. In all Grand Slam meetings, Nadal has a clear advantage with a 9-5 win-loss record. No two men have met more often in the Open Era, and no pair have pushed one another harder or further. Their only previous final in Australia, in 2012, developed into a record-breaking 5hr 53min slugfest. It stands as the longest final in Grand Slam history - some say the greatest - and it left the pair barely able to stand at the trophy ceremony after an exhausted Djokovic staggered over the line 7-5 in the final set. “Nadal has historically throughout my life and career been the greatest rival that I ever played against, on all the surfaces,” Djokovic said. “I had some disappointing moments where I lost to him. I think I’ve lost to him nine times so far in the Grand Slams. I lost some tough matches. I won also some great matches. Both are back in the final after injury-plagued seasons in 2018. Djokovic was hampered by an elbow that needed surgery after being bundled out of Melbourne in the last 16. Nadal retired injured in both Australian and US Opens and had an operation on his ankle in November. The Spaniard, who had not played a competitive match since the US Open before arriving in Melbourne, has rampaged through the draw without losing a game on his remodelled serve. He has not dropped a set. “I just have to think my way. I have to keep doing the things that I am doing,” he said after swatting aside Stefanos Tsitsipas, one of the game’s brightest prospects, 6-2, 6-4, 6-0 in 106 minutes of destruction in the last four on Thursday. Djokovic was only competitive during the second half of 2018, winning Wimbledon and the US Open on the way to reclaiming the number one ranking. He will retain top spot whatever Sunday’s result but knows how much is riding on the final. “There’s so much at stake, it’s hard to pick one thing,” he said. “Nadal is across the net. I’m playing a final of Grand Slam for the record seventh title here.